These are a staple at our house. Nothing beats fresh-out-of-the-oven chocolate chip cookies. 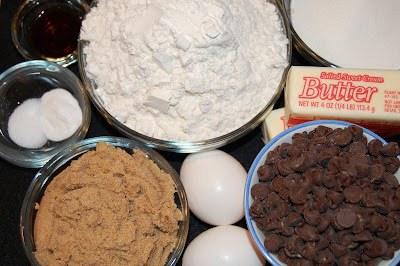 This recipe is everywhere on the back of many brands of chocolate chips, but it makes the best cookies. In a mixer bowl, cream the butter and sugars together. Add the vanilla and eggs. In a separate bowl, stir the flour, baking soda and salt together. Add the dry ingredients to the wet in the mixer bowl and blend together. Stir in the chocolate chips. Drop by teaspons full onto a baking stone or cookie sheet and bake at 375 degrees for 8-10 minutes. 1. I start with the baking stone already hot, just popping it in the oven while it preheats. I think this would work with a cookie sheet too. 2. Real butter is better than margarine. 3. I sometimes bake half the batch and pop the dough in fridge for the next day. This keeps us from eating the entire batch all at once. You don’t want to wait too long to use that dough, though because of the eggs in it. I don’t want anyone getting food poisoning! I also like the idea of one batch baking. You’re one smart cookie! You are right. Nothing beats a warm chocolate chip cookie. Okay I have a confession…sssshhh though keep this one on the QT. Even though I went to cooking school in Spain for a short while and took lost of classes here.. and dispite the fact that I’ve owned and operated my own catering/party planning business… I can’t EVER get my chocolate chip cookies to come out looking like YOURS! Mine never spread they always look like dump cookies. Any thoughts on why? I’ll be trying your reciepe. Maybe it’s mine that doesn’t cut the butter? If after the first batch goes into the oven I find my cookies are spreading too much, I always add a bit more flour before I put the next bunch in to bake…so maybe you could add a bit less flour and yours will spread a bit more. LOVE warm chocolate chip cookies.. Nothing is better. They look terrific! Great Idea. I love chocolate chip cookies myself. The chocolate should help boost overall mood too. Added bonus. Those look so good – and is there any better smell than chocolate chip cookies baking in the oven? And I agree – butter is ALWAYS better than margarine in baking. Your cookies look awesome. I use the exact same recipe. An added tip my sister taught me: leave the butter sitting out a while to let it soften. She claims it’s much better than being impatient and putting it in the microwave for a few seconds. 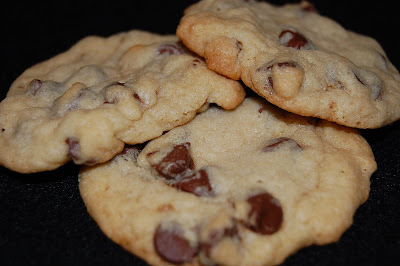 These look SO good, is there anything better then a warm chocolate chip cookie? Great blog! you said : . I start with the baking stone already hot, just popping it in the oven while it preheats. I THINK this would work with a cookie sheet too. So you haven’t tried this yourself? I haven’t tried preheating the cookie sheets. I think because they are metal and heat up quicker than the stone, it wouldn’t be as necessary. For cookies I use all-purpose flour. No special brand. This looks yummy and simple. I have a question, how many cookies do you get with your recipe? Thank you. About 5 dozen, depending on how big you make them. Tiffany, I tried it but how come mine doesn’t come out as crisp? It ‘s more like “cake-y” than cookie. What did I do wrong? Rina, we like ours soft so I’m not sure how much help I’d be on making them crisp. This recipe should turn out soft though. I know when we bake them an extra minute they are crisper, but it’s not the way we prefer them.